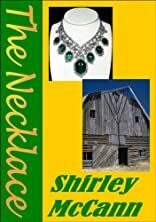 About Shirley McCann (Author) : I've published one middle grade novel through Iuniverse, but am now marketing a young adult suspense novel. I've also published several short stories in various magazines. 9/18/2009 Shirley McCann said: This was my first children's book. I used iuniverse. While it was a great experience, and I really loved my book, I hope to move to a traditional publisher for the next ones.